Fill these out before your first appointment! At Twain Harte Family Dental Care, a family-friendly practice, we strive to deliver painless treatments to patients from Sonora, Twain Harte, Tuolumne and neighboring communities. Everyone at our office, from Dr. Phillip Grossman, Dr. Nolan Korando and Dr. Andrew Le to our team members, is committed to keeping your mouth in excellent health, through personalized treatment plans and finding care solutions that are right for you. Here, we believe in developing long-term relationships with our patients and their families. We want to know you as a person, not just another patient, and to learn about your life and interests. Our team is people-oriented; we’ll do everything we can to establish open lines of communication, as well as trust and respect, starting from your first visit. 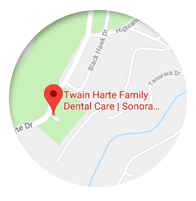 Twain Harte Family Dental Care is located in Twain Harte, CA, convenient to families from Sonora, Tuolumne, and surrounding areas. For more information about our approach to dentistry, and to schedule a consultation for yourself or a loved one, please call. We can’t wait to welcome you to our dental family and start you on the path to optimal oral health and a beautiful smile! Only a 10 minute drive from Sonora, CA!